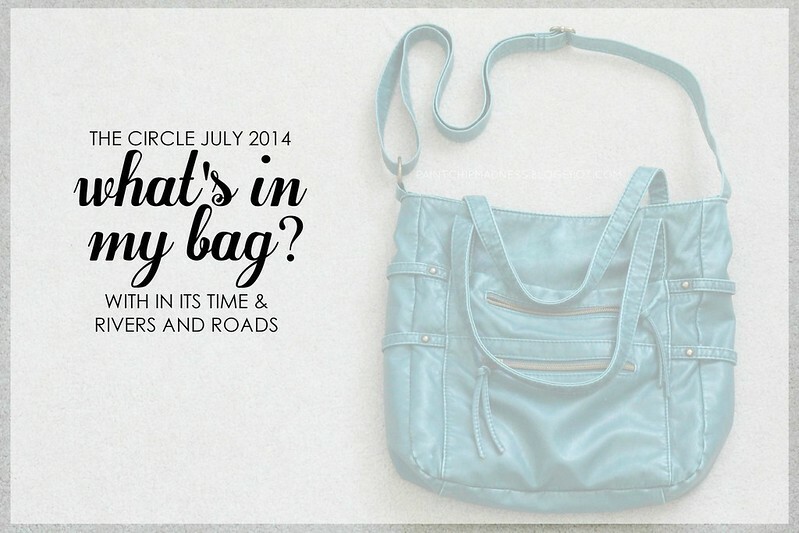 THE CIRCLE JULY 2014: WHAT'S IN YOUR BAG? I don't know about you, but when it comes to blogging, I can be a total snoop. I am a sucker for a day in the life posts, vlogs, home tours, and the like. So yes, you can call it snooping, but if you ask me, I think it really gives you a better picture of the blogger. It helps you get to know them a little better and it also is a great way to share the little pieces of your life that you normally wouldn't. That, and it makes for a fun post to read, too. I mentioned on Friday that this month's The Circle theme is all about sharing what's in your bag. Yep, we're sharing what's in our purses, camera bags, work bags, or even beach bags. And if you've already published a post that fits this topic, feel free to link it up anyway. The more the merrier, right? 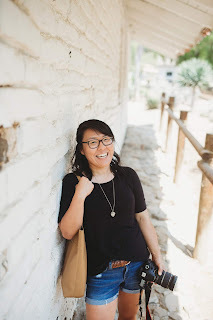 Rivers and Roads is a lifestyle blog full of stories about my life in Tennessee, the mini adventures I go on, my journey with Jesus, DIYs, photographic endeavors, my love for Colorado, and my print shop dreams. I have been surprised and joyfully overwhelmed by the friends I've made in this community that have encouraged me to dream, pursue, and grow. I always want my blog to be a place where we can all grow together! Meg is awesome, right? And because I know you're just as curious as I am, be sure to check out Meg's blog to see what she's got in her bag. And now that I've cleaned out my purse (true story), here's a glimpse into my purse. It's purse that's seen better days, but it's a tried and true beloved bag of mine. It has the perfect straps (crossbodies for the win! ), a fun color, and tons of pockets, too. And did I mention it's also from Claire's? Yep, who would've guessed. HELLO KITTY POUCH: This little pouch holds some band-aids, ponytails, and a few emergency meds, too. Because if you ask me, when you need something for allergies or a cold, you want it now, not later. BLUE FLORAL POUCH: This pouch was a serious win when I went shopping in California. There are Japanese stores called Daiso where almost all the products sold are $1.50. It's like a Japanese dollar store and it's pretty much heaven (especially since their products are higher quality than one would think!). Anyway, that pouch holds a comb, concealer, mirror (the turquoise rectangle on the pouch), and lip balm, too. I'm not too much of a make-up girl, but it's when you still breakout and/or want to make sure your hair isn't too crazy, it's a necessity to carry these items. OTHER GOODIES: These things reside in various pockets of my purse and are kind of the odds and ends, too. I've got my wallet, CPR mask (my CPR/First Aid instructor would be proud I've included this! ), mint gum (fresh breath for the win), Kleenex, hand sanitizer, and reusable bag, too. So yes, there's a little bit of everything in that bag of mine. I guess it would be easy to conclude that I am not one of those girls who can carry a itty bitty purse. No offense if you do carry one of those bags--I truly admire that you can put everything in one little space! I should also probably mention that I used to carry a lot more than what's pictured. But since I sometimes pack my camera or a waterbottle inside my bag, I've had to downsize and prioritize what stays inside. And because it wouldn't be a link-up without it, now's your chance to share a few photos of what's in your bag! Do you carry everything in one bag, or you more of a minimalist? Do you prefer crossbodies to totes or handbags? I want to know what's in your bag and I know your blog friends do, too. So add your link below, grab a (new!) button, and check out what's inside everyone else's bags, too. p.s. Feel free to spread the word and use the hashtag #thecirclelinkup on Twitter and Instagram, too! I definitely feel like I have a survival kit inside my bag. I even have floss! And usually Kleenex, although I didn't when I took pictures. Thanks for reminding me to go add some Kleenex! :) I've never done one of these "what's in my bag" posts before, so thanks for the inspiration. Is it weird that I've actually been meaning to get some floss to add to my purse? I'm definitely going to have to put some into my bag now. :) And I can't wait to read your post! I am a big purse, chock full of stuff kind of person too! My family is always trying to figure out what weird thing I have in my bag.....There have been things like decks of cards, chopsticks (with no recent trip for chinese), and in the days of walkmans, I'd even keep my player and a stack of cds in there! I envy those you can fit everything into a little wristlet or fannypack sized bag. Yes, I guess you'll just have to. :) I'm excited to read your post! This was a fun post. Thank you for sharing - I just linked up. The odd things I have in my purse are a book light, flash light, sewing kit, q-tips and sticky tabs. I love crossbody bags! Yours is so cute :) The color is my favorite part! Same! Crossbody bags are my favorite. 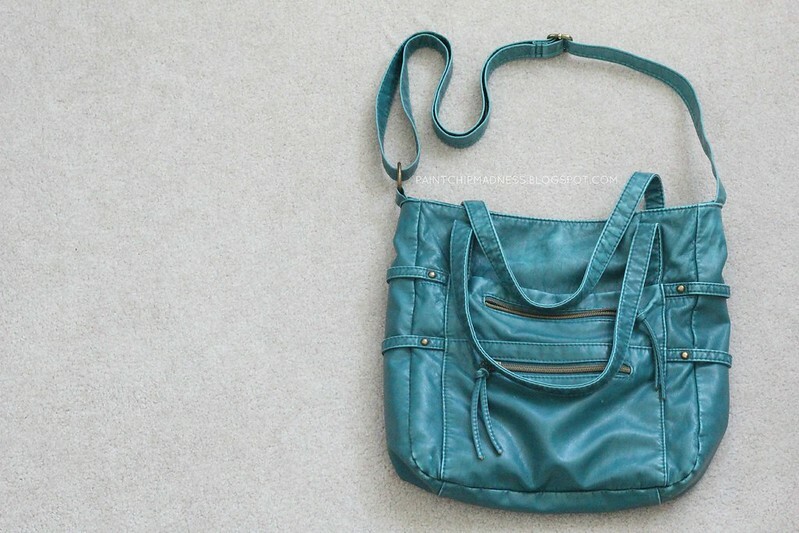 :) I love shopping for new bags because it's so much fun to pick out the color and the style. Girl! You really are prepared! You've got some good stuff in there! Concealer twins! It must be good if you use it, right? :) And I'm just glad I'm not the only one who still has to use it every now and then--I keep waiting for the day when I won't have to! The hello kitty pouch is CUUUTE! you have cute stuff in your bag....mine is like an explosion of EVERYTHING haha. Well, this photo was taken AFTER I cleaned it out and got rid of a gum wrappers and other random stuffff. Just being honest, haha. :) And yes, please join! I'd love to read your post! Love your bag! :) I linked up a post I wrote earlier this month! This sounds like such a fun Link up, I am totally joining this month. 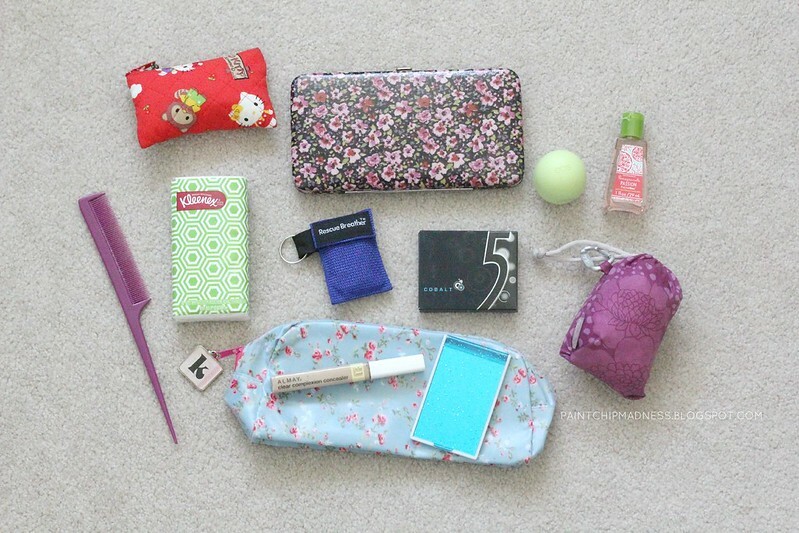 It's always so interesting to see what women carry in their bags. I'm so glad I came across your blog and now your newest follower. And I can't wait to get to know you, too! I love finding new blogs to read! I have loved hopping around blog land and see what is inside everyone's purse! So so fun! I have a tendency to pack light, but all these bags are making me want to add more! The color of your bag is so pretty! your CPR mask must be pretty tiny; mine is in a giant plastic case so I don't carry it with me, but that's great that you do! I guess you're the prepared person that everyone should try to be around in case something happens (: thanks for hosting the link up! Thank you for sharing valuable information. Nice post. I enjoyed reading this post. The whole blog is very nice found some good stuff and good information here Thanks..Also visit my page. bags we understand that our clients' goals are our goals. I always love snooping through other people's purses (via the internet, I don't do it in real life). I love the color of your purse, so cute! I've never linked up with The Circle before, when do you sure what next month's post will be about? Same! It would definitely be a little awkward if we did it in real life, but in blogging, the rules definitely change. :) And there's still time to link up if you'd like! The link-up lasts through the entire month. Ah, love Meg! She's so precious. I always lovvvve finding out what other people carry in their bag. I'm a snoop, too! I love your bag, btw! Who doesn't love Meg? She's awesome and I'm so lucky to have her co-hosting with me. Girl, we have half the same things in our bags! haha! Love your bag! Thanks for co-hosting with me, by the way! It looks like it was a really popular theme this month! Is that a ChicoBag? I keep one with me too. :D What a fun theme for this month (thanks!). Will be posting mine soon. It is, indeed! My grandma gave me mine and I'm so glad she did because it comes in handy more often than I ever imagined. :) And I'm glad you're going to post yours soon--I can't wait to see what's inside your bag! YES! Daiso!! There is one right by my grandma's house and I LOVE that store!!! I always try to stock up on items (they have some awesome q-tips and face washing stuff) while I'm there! Your purse is super cute too! I love the fun color! Thanks for linking up with us, Aubrey!